Have you ever had a meal at a restaurant that you kept thinking about days, even weeks later? This Parmesan crusted chicken from the Longhorn Steakhouse was so memorable, I had to search for a recipe and create it at home. It was served with a spicy citrus rice pilaf, which I have yet to make. 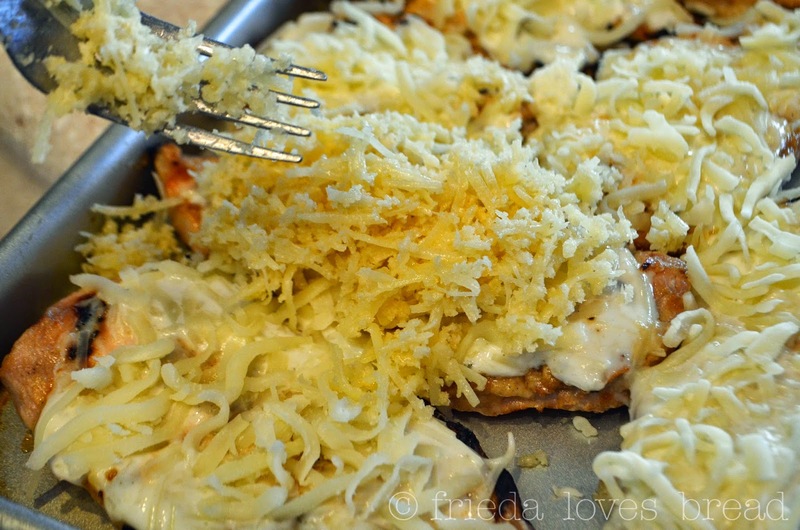 This garlicky, cheese-y, ranch flavor infused chicken is so tender and the crunchy Parmesan topping really makes this recipe so darn good. My entire family enjoyed it and requested that it be part of our regular rotation. Rather than pound the Costco sized boneless chicken breasts into 1/2" thickness, I opted to slice the partially frozen chicken horizontally in half. 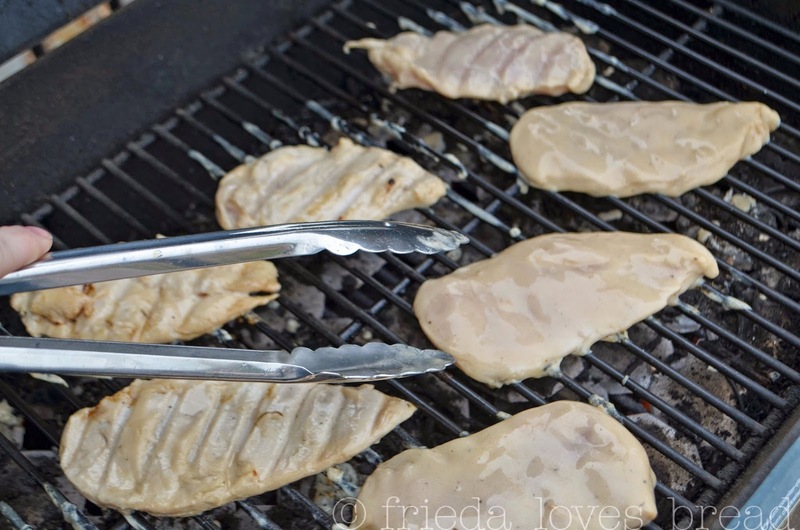 Cooking or grilling a thinner slice of chicken is much faster. The chicken breasts are then marinated in a mixture of ranch dressing, oil, garlic and other spices for at least 2-3 hours. I love using my Food Saver to marinate/tenderize my meats in 20 minutes flat. The marinated chicken is then grilled for 12-15 minutes total. You can also cook this chicken using your oven broiler. 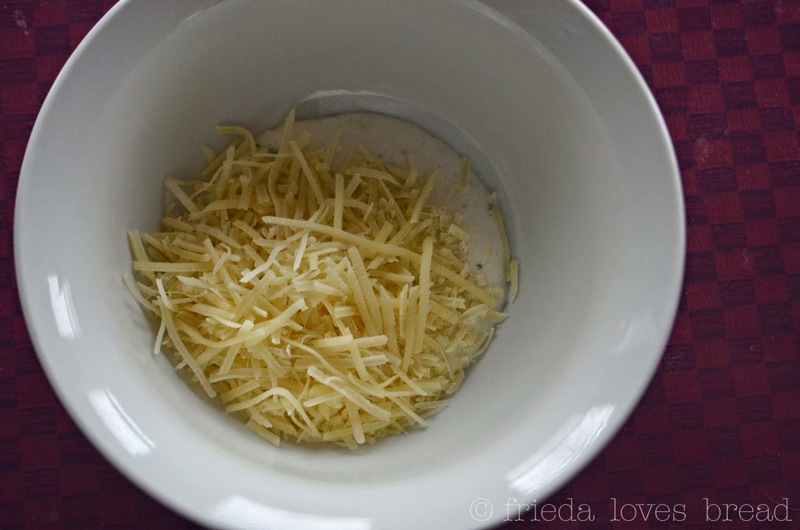 If you can, please, please, use the REAL grated Parmesan cheese. Not the stuff in the green plastic bottle: Parmigiano Reggiano - 1 Pound I keep my Parmesan cheese in the freezer, always ready to use. The next layer uses extra crunchy panko bread crumbs (I like Kikkoman Panko Bread Crumbs 2 Pound Box ) and a mix of garlic, melted butter and more Parmesan cheese. Place the prepared chicken under your broiler and watch it carefully. You want it bubbly and golden brown. 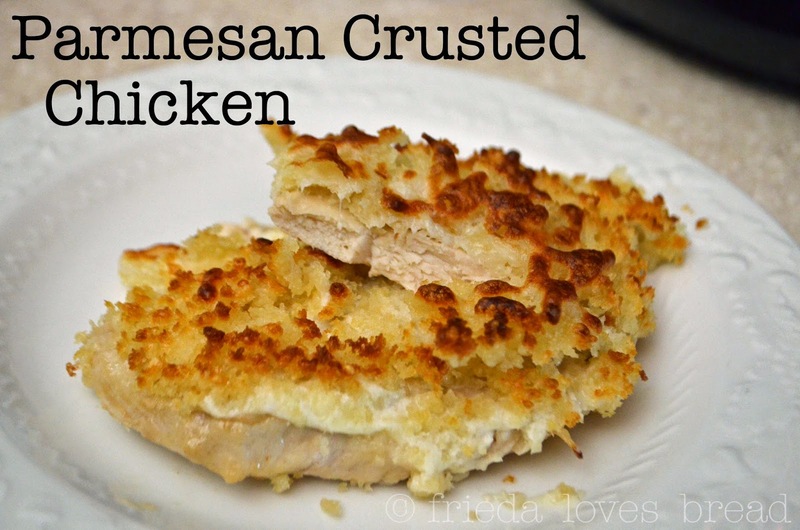 You then will be rewarded with the BEST Parmesan chicken you and your family has ever tasted! 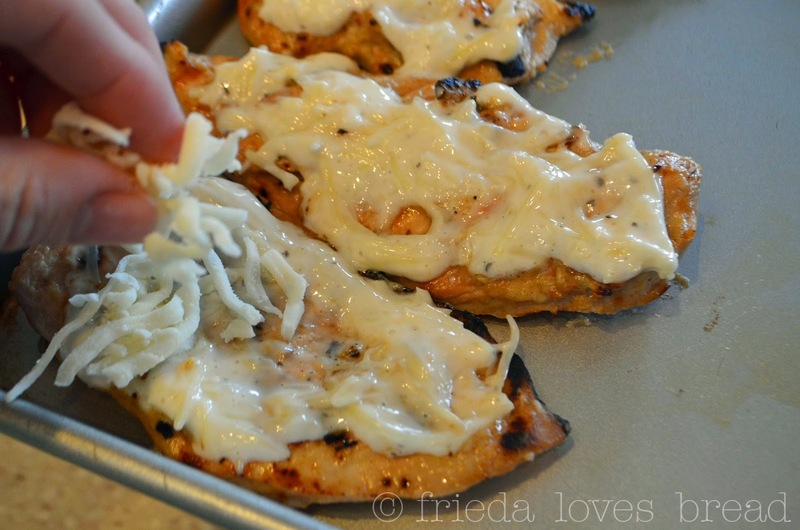 Thin, marinated chicken breasts have a layer of cheesy ranch dressing, topped with a buttery, crispy, garlicky, cheesy crust. Chicken can be grilled or cooked quickly using your oven broiler. 1. Pound or cut raw chicken to 1/2" thickness.2. Prepared marinade. Stir together: oil, ranch dressing, Worcestershire, vinegar, lemon juice, garlic, & pepper.3. Put chicken in marinade, cover and set in fridge for 2-3 hours or over night. 4. Grill chicken over medium-high heat for 12-15 minutes or until internal temp is 160°F. Put chicken on baking sheet or inoven-safe casserole dish.5. Prepare Ranch Spread. Stir together 1/4 cup Parmesan cheese with 1/4 cup ranch dressing.6. Spread 1 Tablespoon of ranch dressing evenly onto each chicken breast.7. Prepare Crumb Topping: Mix together Panko, garlic powder, Parmesan and mozzarella cheeses.Toss in melted butter. Crumbs should be evenly moistened.8. Sprinkle 1 -2 Tablespoons of crumb mixture on top of each chicken breast.9. Position oven rack 6-8" from the top broiler and preheat. 10. 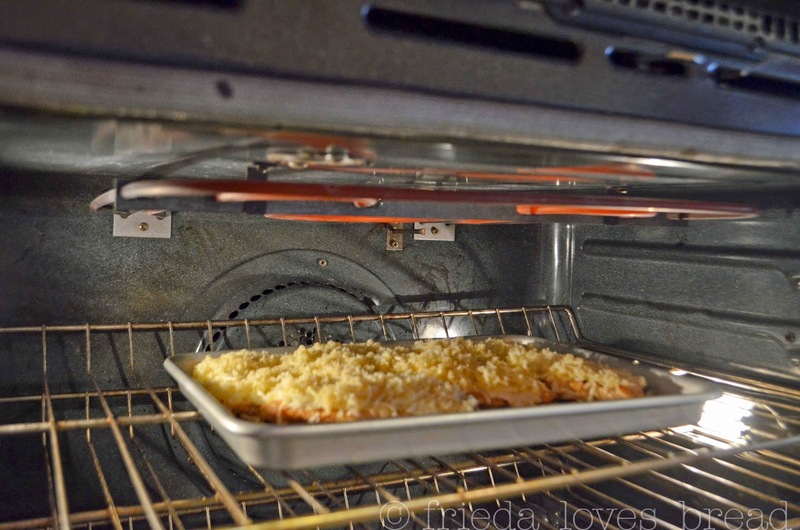 Place chicken under broiler and cook until cheese melts and crumb topping is a light, golden brown.Serve immediately.